The benefits of grass-fed beef are hard to deny. From the nutrient content to the fatty acid composition to the ethical issue of treating animals without cruelty, meat from grass-fed, free-range cows win every time. It’s not just the cows, though. Very similar benefits apply to eating any animal that was raised in its natural habitat. With pigs and chickens, though, it’s a little more complicated than “grass-fed” because these animals don’t just eat grass. Instead, they’re natural omnivores, designed to eat a little bit of everything. That’s why we usually refer to “pastured” or “free-range” pork and chicken instead of “grass-fed.” It’s just a different name for the same principle of raising animals in an ethical, compassionate way. Pastured pork and poultry isn’t just more ethical, it’s also a lot better for you, and it’s worth the time and money if you can possibly make it work. One caveat, though: this article isn’t intended to make anyone feel like a bad person because they can’t afford pastured meat. The problem is with the industrial food system, not with you. But it’s important to know what the best meat choices are: the more people who are aware of these issues, the more demand will rise for truly healthy animal products, and the more affordable those products will be. What’s Wrong with CAFO Meat? CAFO (Concentrated Animal Feeding Operation) meat comes from animals that have been raised in factory farms, where the living conditions are unbelievably horrifying. The ethical issues would be more than enough to justify boycotting factory farms forever (and a full description of how these farms operate would give you nightmares for a year), but this is a site about health and nutrition, not philosophy. So this article will just focus on the potential human health dangers and drawbacks, and leave the ethical issue to your personal judgment. From a human health perspective, one major problem with CAFO farms is their dismal hygiene and safety record. Runoff from the manure has caused outbreaks of E. Coli and other diseases, when the contaminated waste floods into rivers and streams. They’re bad for communities, too: factory farms destroy local economies and actually increase unemployment and income inequality. An even bigger public health problem is the way the animals are fed. They eat a disgusting variety of waste products and whatever else the agricultural industry needs to get rid of. If you have a really strong stomach, take a look at this list, which includes meat judged unfit for human consumption, manure (yes, they eat their own poop), and even plastic (this is supposed to replace natural sources of fiber like grass and leaves). They’re also stuffed full of anything that might make them grow or gain weight more quickly, no matter how toxic it might be down the line. Such a disgusting diet isn’t just bad for the animals; it’s also bad for the humans who eat them. This paper gives a fairly comprehensive overview of all the potential human health. One point of concern is the antibiotics in their food. Antibiotics are familiar to most of us as human drugs, but in fact 80% of antibiotics in the United States are actually fed to animals, mostly to make them grow faster and prevent them from getting sick and dying under such filthy and crowded conditions. The problem with this, though, is that bacteria are clever little microbes, and quickly evolve resistance to common antibiotics. Then the drug no longer works. This is bad enough when you’re talking about sick chickens, but it actually gets worse: antibiotic-resistant germs can pass from the meat to the people eating it. To name one example, a strain of drug-resistant E. coli from factory-farmed chickens may be infecting more and more women with urinary tract infections that don’t respond to antibiotic treatment. Another major problem with the diet of factory-farmed animals is arsenic. Arsenic is a powerful carcinogen to humans, but routinely fed to chickens and pigs to make them grow faster and improve the color of the meat. One study found that eating just 60 grams of chicken (about 2 ounces) per day could lead to an arsenic intake of 1.38-5.24 micrograms/day; compare that to the World Health Organization’s “safety limit” of 2 micrograms/kg/day. Then there’s the nutrition issue. Industry by-products and processed soy just don’t make for a very nutritious diet, and the meat from these animals reflect that. But quantifying exactly how much more nutritious pastured meat is gets a little tricky. It seems like a total no-brainer that animals raised on pasture would be healthier than animals raised in confinement, and if you put it that simply, it’s true. But doing any kind of study on the issue is very difficult. For one thing, not all “pasture” involves the same kinds of food, and this can skew the results quite a lot. Not all breeds of animals are the same. And it’s also surprisingly hard to tell whether an animal was actually raised in an honestly “pastured” setting or not. “Free-range” in particular, is not a very useful term. All this means is that there must be a door in the barn – a door that the animals may or may not ever use. So in theory, there could be absolutely no difference between the life of a “free-range” animal and the life of a non-“free-range” animal. It certainly doesn’t imply the kind of chicken paradise that you’ll see on Martha’s farm. Because the definitions of “pastured” and “free-range” can refer to such a huge range of actual living conditions, it’s no surprise that studies show conflicting results. But what’s even more impressive is the consensus: despite all this inconsistency, the weight of the evidence still points to pastured, free-range meat as nutritionally superior. In pork, one big issue is fat quality. This comes pretty much directly from their diet. In the wild, pigs eat pretty much anything they can get their snouts into: roots, grass, leaves, grubs, nuts (most famously hazelnuts and acorns), berries and fruit, and insects. Under human care, they’ll also happily eat table scraps with no ill effect, provided those table scraps came from healthy food in the first place. Contrast that with the typical diet for factory-farmed pigs, which is largely based on corn and soybean meal, together with all the disgusting additions mentioned above. 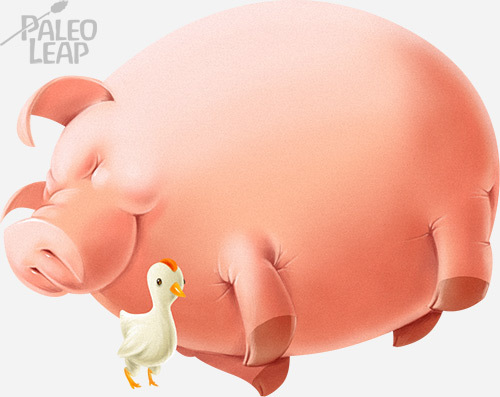 This feed is very high in Omega-6 PUFA, and the more Omega-6 fats in the pig’s diet, the more will be in the meat. Getting back to the pork, a 2012 review that tried to make an overall comparison between free-range and factory-farmed pork had a difficult time, because the studies found widely different results. Some found no significant difference at all; others found the free-range pork to be anywhere from 18% to 291% higher in Omega-3s, with a difference in O6:O3 ratio anywhere from 7% to 42%. Whenever there was a difference, it was a difference in favor of the free-range animals. This variation in results is frustrating but not surprising. First of all, not all pigs are the same; it’s unreasonable to expect totally uniform results. The type of plants on the pasture can also have an effect. Then you have to consider that all these studies raised the pigs in different ways. It would really be more surprising if the research all agreed! Truly pastured pigs get more Omega-3s. Green grass and leaves are major sources of Omega-3 fats in animal diets – these are foods available to truly pastured pigs, but not to “free-range” pigs that actually live in a barn. And there’s a lot of evidence that feeding acorns increases the Omega-3 content and MUFA content of the meat. In other words, pigs eating their natural diet get a lot more Omega-3s than pigs in a factory farm. The effect of dietary Omega-3s is very significant. One group of researchers studied two groups of pigs. One group of pigs ate a diet supplemented with 5% linseed oil (very high in Omega-3 fat); the other group was the control. 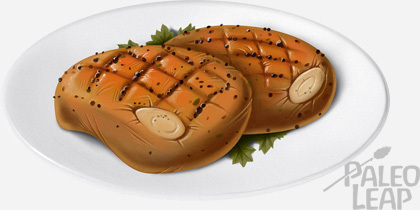 At the end of the study, ham made from the Omega-3 group had an O6:O3 ratio of 2.5:1 (healthy), while ham made from the control group had a ratio of 12:1 (less healthy). Looking at these two facts, it seems reasonable that the truly pastured pigs (as opposed to “free-range” pigs that really aren’t) would be on the high end of the benefit spectrum. All pigs have a fairly high O6:O3 ratio, but the pastured pigs are the clear winners compared to their factory-farmed cousins. The results for micronutrient content are less impressive. 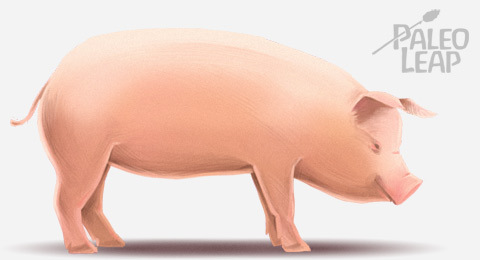 For Vitamin E, the 2012 review found that free-range pork provides 1.7-5% of the RDA, compared to 0.8-2.5% for CAFO pork. For iron, the difference was even smaller: 3.6% for free-range vs. 1.1% for CAFO. This could potentially make a difference if pork is your only source of Vitamin E or iron, but it’s not extremely significant in the context of an otherwise balanced diet. The upshot: pastured pork doesn’t necessarily have more micronutrients, but its fat quality is likely to be significantly better, as long as it was truly raised on a pasture and allowed to eat a natural diet including green plants and acorns. Chickens are a little bit more complicated. The same review that couldn’t give any conclusive numbers about “organic” pork also couldn’t provide clear data for “organic” chicken. Overall, the “organic” birds had more Omega-3 fats, although the numbers get a little complicated here, because the ratios vary depending on whether you test white or dark meat. But there was still quite a lot of variation, with some studies finding no benefit. Considering what we know about chicken feed, this isn’t surprising. 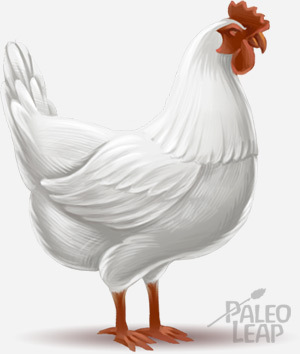 Like pigs, chickens will have a better or worse fat quality depending on what they eat. The biggest sources of Omega-3 fats in a chicken’s diet are green plants (grass and leaves) and the bugs that eat them. So it’s not hard to see how some of the technically “organic” chickens might not have better Omega-3 levels, while truly free-range birds do. But there was a diamond hidden in the rough here: the difference between fast-growing and slow-growing chickens. Fast-growing chickens are hybrid breeds prized by the food industry because (as their name implies) they grow to slaughter weight very quickly. They’re specifically bred to have an insatiable appetite; they’re basically designed to put on maximum weight in minimum time. This makes them very large and very fatty – up to 50% fattier than free-ranging traditional breeds. Unfortunately, they’re also pretty helpless without human care. Their immune systems are weak, they have a hard time with basic foraging and ranging, and they tend to do very poorly on pasture. Their bones are fragile, and prone to fractures. They have larger breasts (18% of body weight compared to 9% for traditional breeds), but correspondingly smaller hearts, making them prone to random heart failure for no particular reason. Essentially, the hybrid breeds have sacrificed health, hardiness, and everything else for the sake of rapid growth. That’s all fine if you’re raising chickens in a factory farm, but it makes hybrid chickens very unsuitable for life in the barnyard. So a lot of small-scale farmers (people who honestly pasture their birds) turn to slow-growing heritage breeds instead. These heritage breeds have significant nutritional differences. One study, for example, found that the O6:O3 ratio in the breast meat of pastured slow-growing birds was 4.3:1 (not bad), while for pastured fast-growing birds on the same feed, it was 6.8:1 (way too high)! The upshot: buying your chickens from a small CSA or family farm will give you a double whammy of nutritional benefit from both the healthier breeds and the healthier diet. If they’re truly pasture-raised, they’re probably also heritage breeds by default. Then there are the eggs. The difference between eggs from a happy chicken and eggs from the grocery store is obvious as soon as you crack them into a frying pan: just look at the dark orange color of the free-range yolks. Side-by-side, grocery-store eggs look pale and anemic, and the taste is unimpressive to match. Here again, the sum of the studies is confusing, although the overall result is distinctly favorable to the free-range eggs. The overall review concluded that free-range eggs have between 26% and 170% more Omega-3s overall, with a lower ratio of Omega-6 to Omega-3 fats (between 1.3:1 and 14.1:1 for the free-range eggs, and between 11.2:1 and 19.9:1 for the caged eggs). Free-range eggs also contain much more Vitamin E, which is especially significant because eggs make an important contribution to overall daily Vitamin E intake. Again, that’s a lot of variation! The specific nutritional content of the eggs depends on what the hen was eating – one study fed the hens on either alfalfa, clover, or mixed grasses, and reported widely varying nutrient density in the eggs even though all three groups were pastured. For example, the grass group had 23% more Vitamin E than the clover group. All three of the pastured groups had better fatty acid ratios, and as much Vitamin A as supermarket eggs, even though the eggs themselves were smaller (so in other words, the pastured eggs were more nutrient-dense per calorie). A more interesting study looked at several different varieties of free-range eggs from various organic farms (so you know they’re actually produced in the spirit of ethical farming) and found significant differences between the free-range eggs and the standard “Nutrition Facts” for an egg. The pastured eggs had more Vitamin A (792 IU vs. 487 IU) and E (24% of the RDA vs. 6%), more Omega-3s, and more beta-carotene, accounting for the rich orange color of their yolks. Those are significant differences – enough to seriously affect the nutrient quality of your diet. The upshot: the case for pastured eggs is even better than the case for pastured chickens! They’re not only higher in vitamins and minerals, but they also contain better-quality fats. With growing public awareness about the cruelty of factory farms and the nutritional superiority of the alternatives, there’s been growing demand for meat raised outside this system. Unfortunately, food marketers have been very quick to take advantage of this demand with “greenwashed” meat: products that try to trick you into thinking they’re raised ethically, but actually aren’t any different (except for their price tag). A very comprehensive guide to decoding these label claims can be found here for pork, here for poultry, and here for eggs. To get the real benefits of pastured animals, these are the products you really want, not the technically “free-range” animals that have never seen the sun. To make a long story very short, by far the best option is to get your meat from a farmer or a CSA, where you can ask your own questions and rest assured that you’re getting what you think you are. You can find a farm in your area using this tool. Failing that, do your homework very well – don’t fall for meaningless claims like “vegetarian-fed hens” (chickens are naturally omnivores; this is not a health benefit!) or “all-natural” (which means nothing at all). “Organic” also does not mean “free-range,” and even “free-range” doesn’t necessarily mean much at all. It’s a very sad fact, but getting high-quality meat requires a serious struggle through all kinds of marketing ploys designed to trick you into paying a premium for the same old factory-farmed product. If you have the space and the time for such an ambitious project, an alternative that’s been growing in popularity over the last few years is raising your own chickens. This is possible even in the suburbs (although it’s not always workable in more densely populated urban areas. Chickens actually make quite friendly pets, and raising them yourself gives you total control over their food from start to finish. Be aware that if you’re raising chickens for eggs, the birds will live several years after they stop laying. You’ll have to decide whether you want to kill them for food or keep them as pets. And constructing an entire backyard ecosystem definitely isn’t a project for everyone. But growing your own birds can be fun and educational, so if you have the resources it’s something to look into. The elephant in the room, as always, is that ethical animal products have a higher price tag at the grocery store. But what’s never mentioned here is the hidden cost of factory farms. Ethical meat only has a higher price at the grocery store because you’re paying the total cost of its production at the checkout. In reality, you’re paying much, much more than the sticker price for factory-farmed meat; you just don’t realize that you’re paying it. Factory farms rely on heavy government subsidies to buy feed for their animals, and clean up the masses of toxic pollution that they leave behind. Those subsidies come from your tax money. Before the 70s and 80s (when CAFO meat became the standard), people spent more money on food as a proportion of their income. Now, we spend less money on food and more money on cleaning up after the shortcuts we take to get that food so cheaply. It’s not a question of paying or not paying; it’s a question of paying the grocer or paying the government. The choice is yours, but don’t fool yourself into thinking that you aren’t paying for it either way. To make pastured meat more affordable, look into a meat CSA in your area, or see if you can buy ¼ or 1/8 of the cow directly from the farmer: this will net you a substantial discount per pound. It’s often a lot cheaper to buy from a farmer than to go to the butcher’s counter in the grocery store. Unsurprisingly, animals raised in their natural habitat are healthier than animals that are given lousy food and constantly stressed. It’s hard to get precise numbers about this (due to the different types of pasture, the differences between animals, the “organic” farms that might not really be any different from factory farms), but all the evidence we have points to a substantial improvement in nutritional quality, especially in fat. This is particularly important for pork and chicken, because these two meats are relatively high in PUFA. With beef, grass-fed has more Omega-3s, but the difference isn’t so significant because there’s such a tiny amount of PUFA in the beef to start with. With pork and chicken, you’re getting a lot more PUFA overall, so the quality really counts. Again, it’s important to stress that you’re not a bad person if you have to rely on factory-farmed meat. Sometimes, money is just that tight, and you have to make due with what you’ve got. (On the other hand, if it’s a choice between grass-fed meat and a custom paint job on your new car, it might be time for some serious reflection on your priorities). If you can only afford one kind of ethically raised food, I’d suggest you prioritize eggs. That’s because pastured eggs have not only a better fatty acid profile, but also more micronutrients: you’re just getting a little more bang for your buck. Overall though, any pastured animal products that you include in your diet will be a huge health improvement, and a lot more ethical and sustainable than the factory-farmed alternatives.